It’s becoming a myth that UV mapping is the most tedious task in 3D, especially for beginners. New tools, workflows and algorithms have taken a lot of the tedium out of the task. And not just here at Rizom-Lab, you can see other applications are exploring better workflows as well. Which is a good thing, as a UV map is the glue that binds your model, its bakes and textures together. Despite the increased ease and tools, UV Mapping basics are still a fundamental skill to possess for any CG artist, as a bad set of UVs and outputs can make a really good model look really bad. If you ’re new to UV unwrapping, you’ll learn the vernacular easily enough, but one of the most critical issues is to figure out where to even start and what to do, when. We hope this section will help you with this, as well as showing you tips, tricks and how-tos. Why do you need UVs? Many consider a UV map the glue between texture and model, because a good UV map will give you a distortionless canvas to paint your textures on. In addition, a UV map is the basis for your bakes – normals to AO to curvature. Which in turn means that bad UVs give bad bakes. It’s as simple as that. You can always tweak bad bake maps in Substance or Photoshop in a pinch, but bad map-output can be a real pain to fix. Which also means you need to think of your UVs when you model, but let’s not go there quite yet. UV space is a set of coordinates, based on a 0 to 1 grid. 0,5 are the middle coordinates. And here’s why it’s called a UV map: A UV map consists of your 3D model’s XYZ-coordinates flattened into 2D’s UVW-space, or tile, as it’s called. In plain English, this means that – depending on your modeller and UV mapper – 3D’s horizontal X-axis equals U in 2D space, vertical Y equals V, and the depth coordinate Z equals W. And it’s named UV(W) map solely to avoid confusion with 3D’s X, Y and Z. This matching up of axes is (simply put) how 3D space translates into flattened 2D space. Some renderers and texturing applications take this a step further by also providing support for something called UDIM – U-Dimension – tiles. Simply put, UDIMs make UV mapping and texturing easier by allowing you to create multiple UV tiles for the same model by allowing you to have 10 tiles on the U axis, and an (almost) infinite amount on the V-axis. As with a normal UV tile, you can’t have polys outside of the UDIM tiles’ boundaries either or have them overlap, as it will give you issues when baking and also in, i.e. Substance. It’s also worth noting that the recommended format for UDIM exports is FBX, even though the old and trusted OBJ format will handle it well in most cases. 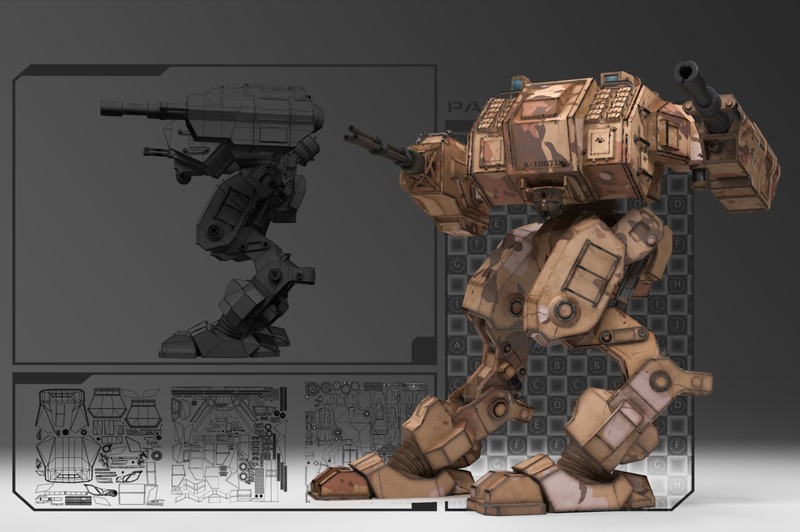 One of the things that made UV mapping a hassle in older applications was that they were heavily reliant on projections – so you had to work with, i.e. planar, circular, or spherical projections to get your model properly unwrapped. This was an ineffective way to get your unwraps done, so many companies, Rizom-Lab included created their own way to do this. They saw that the way to do proper unwraps would be to use algorithms, not projections (except in the most basic, or rare cases in recent years) Rizom-Lab’s own Rémi Arquier was actually the first one to do this, his unwrapping algorithm had been refined for almost 20 years – first at Unfold3D, where, in addition to the standalone unwrapper he also integrated it in Autodesk’s Maya and SoftImage, and now here at Rizom-Lab, his own company. So, you could say our algorithm is pretty solid! And here’s how it works: When you click U for Unwrapping in Rizom, the unfolding algorithms in Rizom look for the flattest shape that can minimise deformation on all polygons in your selection(s). In developer-ese, it uses non-linear, multi-dimensional optimisation techniques. In everyday English, it means it looks on all axes at the same time, not one by one, and continuously optimises, so you will get the flattest possible shell on your UV map. This is one of the reasons why you can set the strength of your unwrapping and optimising strength in the Unwrap Panel spinners, and why it’s so easy to get flat shells fast with our software. How do I use RizomUV? e’re glad you asked! Below, you’ll find a set of links to videos covering the UI as well as techniques We also have several pages like this one, covering basics as well as advanced topics, and we’re building our library!